Words Don’t Come easy crooned F.R David sometime in the 90s but for a lot of us, that is still the challenge even in 2018. Thankfully there are definitely more avenues to learn from now, and one of them is ‘Bound Writer’s Retreat’. The literary baby of Tara Khandelwal, Bound is her way of showing love and support for the literary arts. She calls it a private, personalized Masterclass for Writers, and we have to agree. They are all about bringing aspiring writers, bloggers, aspiring writers and journalists to meet, interact, learn and get mentored by some of India’s leading luminaries in the literary world. So a reading of your book at the Jaipur Litfest could be the next thing you are doing. The workshop will take place this time from July 24 to 29, in an enchanting island in the Mandovi River. 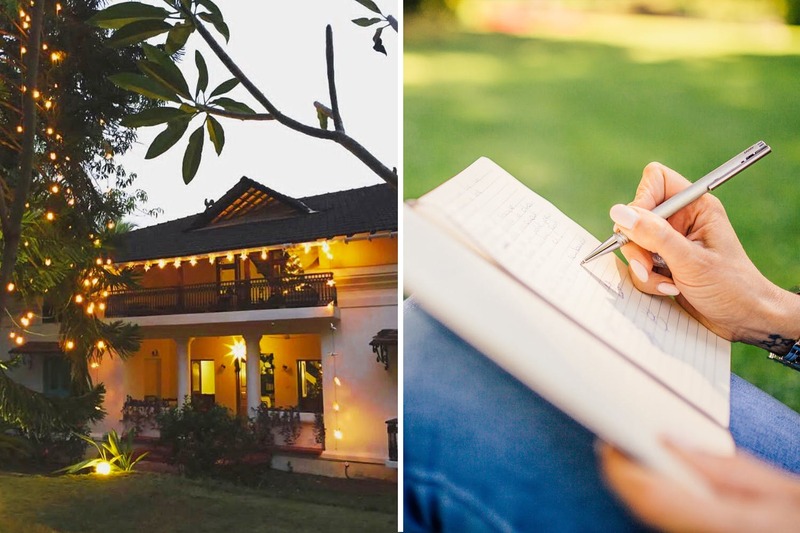 Whether you are an established writer or someone who has had the bug but has been shy of taking the plunge in the world of writing, this retreat is for you. So if you have that book already written, then the facilitators will read it, assess it, give their feedback and make it something that you will be happy to publish finally. Or then, maybe you have that book idea in mind, but you need a nudge to put it in words. Whatever be the case, if words are what gets you excited, then this retreat is for you. At the workshop, you get to interact closely with Chandrahas Choudhury & Prayaag Akbar, both well-known writers and authors of Arzee the Dwarf & Leila respectively. One has been the former editor of Fiction & Poetry at The Caravan, while the other is the consulting editor of the newspaper Mint. So learn the art of character building, building worlds (Dystopian Leila style or something else), plot narration, narrative building, editing, publishing and more from some of the best mentors one could possibly get. Also, meet a whole new bunch of writers, whom you can learn from too. The best part? Do all this while living in a 200-year-old beautifully restored Portuguese Villa on the Divar Island, The Island House. The Divar island is not even connected by road to the mainland & the only way to get there is by a 5-minute ferry ride, which transports you into a whole new world. Walk around the small island to the Church on the hilltop, sit by the jetty or laze in the pool while writing that Bestseller novel, as they have ensured there will be enough free time for all of you to write. Their past workshops have had people from diverse fields. Plus besides the 6 fixed workshops, there will be individual one-on-one sessions for each writer with a mentor tailored to suit exactly what they need. Starting at INR 35,000, these packages will also include stay at this luxurious property & meals, so we say apply now. Send in your writing sample, if you get shortlisted then a phone interview will follow and if you are the lucky chosen one, then off to Goa you go! If you live in Goa or happen to be visiting Goa, but can’t do the full retreat, then you could attend any of their 6 fixed workshops at just INR 2000 per workshop and additional INR 500 if you want to join the gang for a scrumptious lunch after.